The next season of ABC3’s hit drama series Dance Academy will be its last. The internationally-acclaimed series will wrap with 13 episodes but promises to go out on a high. The series was able to attract finance from Screen Australia for a final season of 13 episodes, down from 26 episodes for first and second seasons, which takes its final tally to 65 episodes. ABC3 Channel Controller Tim Brooke-Hunt explained, “Screen Australia was only prepared to fund another 13 episodes which takes it to a total of 65. But I have some sympathy with that. 65 episodes of one title is pretty good. “I am very confident that it’s going to feature on televisions around the world for a couple of decades yet. Dance Academy has been a shining series for ABC3, with both critical and popular praise. In just two seasons it has been awarded by the Logie Awards, The New York Festival’s 2013 Television & Film Awards, Australian Writer’s Guild Awards, Kidscreen Awards in New York, SPAA Independent Producer Awards and was Highly Commended at the 2012 Asian Television Awards. The Australian Children’s Television Foundation, which co-produces Dance Academy, this week drew attention to a downturn in live action dramas. Bernadette O’Mahony, Head of Development and Production from the ACTF, said Screen Australia normally funds 2 seasons in Children’s TV but may fund a third in exceptional circumstances. “Dance Academy was deemed an exceptional circumstance so we got an extra 13 episodes to finish it off,” she said. “Because of the pressure on their funds normally they limit it to 2 series which is 52 episodes. Adult dramas have also taken their leave after passing 65 episodes when tax rebates are no longer available, including Sea Patrol and Rush. Dance Academy has also received praise for dealing with sensitive subjects including self-esteem, sexuality and death. “I got a lovely Facebook message from a teacher about how well it dealt with death and grieving for kids. People tend to avoid it. (She said) What a great resource it was going to be and how kids could use it in the classroom,” O’Mahony explained. 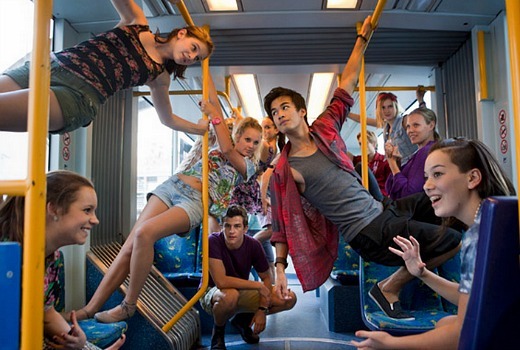 Dance Academy returns to ABC3 soon. It would be hard to continue with another series without changing the characters like Skins. Dance Academy has been a show that has been a popular and critical success and it has tackled some pretty big issues relevant to teens and kids. I actually watched a few episodes mid last year, and it is a very, very well made children’s television show that isn’t insulting. David got it right. The 20% tax rebate doesn’t apply after 65 episodes. Screen Australia’s money is limited. A good show which has had a good run. The commercials will never pick it up because they won’t pay the licence fee required to make it feasible. They only do children’s drama out of sufferance because they have do under their licence. Perhaps readers here can ask their local Federal politician why they all voted to reduce the commercial broadcasters licence fees by 50% which is estimated this year to be a saving of $140 million without any further obligation to invest any of this saving in local drama. This show is both a popular and critical success but Screen Australia can only find funding for 13 episodes and nothing more? I watched Dance Academy with my nieces and we all enjoyed it. It was one of the few ‘childrens’ shows that was not an insult to ones intelligence. If I was a journalist or an auditor, I’d make some enquiries about the goings on at Screen Australia. This smacks of politics – and not the good kind. While it’s a shame that Dance Academy won’t be continuing after this series, at least it’s going out whilst it’s still on a high, and hasn’t out-stayed its welcome. I’d prefer to see it finish its course in this manner rather than go the Blue Water High route, where the final season (or seasons?) looked like they were filmed on someone’s mobile phone. Here’s hoping the cast and crew all go on to bigger and better things too. I am not a kid, i’m 25 years old but this show is so good and its a shame its coming to an end but at least it will go down on a high.